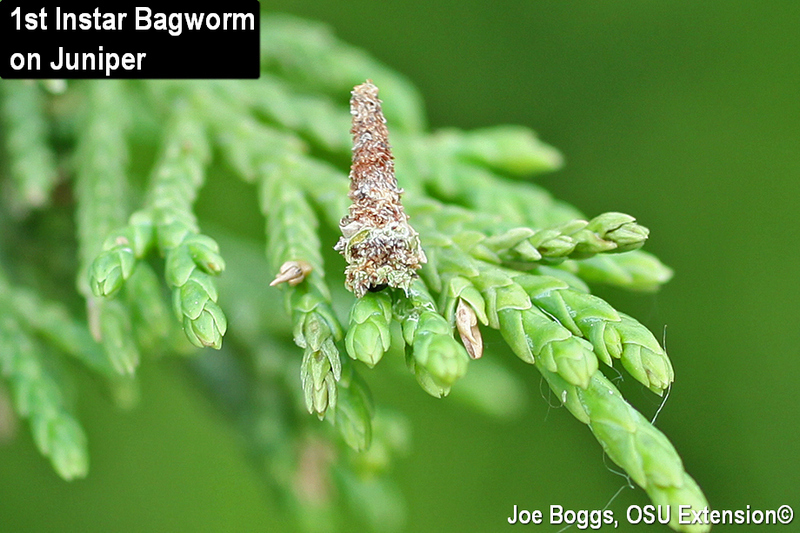 Overwintered Common Bagworm (Thyridopteryx ephemeraeformis) eggs are hatching in southwest Ohio. The 1st instar caterpillars are very small with their bags measuring around 1/8" in length. The tiny bags are constructed with pieces of tan to reddish-brown sawdust-like frass (excrement) stuck to the outside of silk and look like "dunce caps." As the caterpillars mature, they begin weaving host plant debris into the silk which provides structural stability and helps to camouflage the caterpillar bag-abodes. The overwintered eggs hatch within the female bags from last season. A percentage of the 1st instar caterpillars will crawl from the old bags and produce a strand of silk to catch the wind and "balloon" to new locations. This behavior is one of the reasons bagworms often appear on hosts that were not infested last season. I've often used the presence of silk stands hanging from the tips of overwintered bags as an indicator that eggs were hatching. However, heavy rain and high winds may destroy the delicate silk strands. Old bags can cling to twigs and branches for a number of seasons. Look closely on plants that are festooned with bags from past seasons. A single female can produce 500 - 1000 eggs meaning that populations can climb rapidly. Just a few females from last season can spawn damaging numbers of caterpillars this season. Pay close attention to deciduous trees and shrubs as well as evergreens. It is a common misconception that bagworms only eat evergreens. If fact, they are called "Evergreen Bagworms" in many southern states. However, the caterpillars may be found feeding on over 130 different species of deciduous trees and shrubs. Overlooking deciduous trees and shrubs during bagworm inspections allow infested plants to become reservoirs for infestations to spread to neighboring host plants. One of the most damaging bagworm infestations I've ever photographed were feeding on a small crabapple. After running out of leaf-food, the caterpillars began stripping the bark on the tree's small branches and twigs to feed on the sugar-rich phloem. Early instar bagworms can be effectively controlled using the naturally occurring biological insecticide Bacillus thuringiensis var. kurstaki (Btk) (e.g. Dipel, Thuricide, etc.). Fortunately, Btk does not kill bio-allies such as predators and parasitoids that help provide natural control of bagworm populations. Unfortunately, Btk is most effective on small bagworms and becomes much less effective when bags surpass 3/4" in length. Btk is a stomach poison which means it must be consumed to kill the caterpillars and it has relatively short residual activity. Thus, two applications may be required. Once bags exceed 2/3" in length, standard insecticides will need to be used to suppress heavy infestations.